Surprising Super 3D VR goggles Immersive Experience :This is a new arrival 3D VR Headset,with a Remote Controller,which supports many smartphone models with Android and iOS system. Put your phone into this VR , you can enjoy the super big screen effect 3D videos, no need to go to cinema; you can also play 3D games with it, which enables great immersion experience. You can experience the immersive, fun, exciting world of VR and enjoy 360 degree panoramic videos and photos. Compatibility All Smartphones: VR Glasses can fit for most non-curved smartphones with screen sizes from 4.7 ~ 6.0 inch (The maximum size of phone is 170mm (L) * 83mm(W),i.e, 6.693in (L) * 3.268in (W)), immersive experience for any ages. Upload 3D videos sources in Apple App store,Youtube or Google play store or scan our QR code for massive content 3D movies, animation, panorama concert, VR games etc. 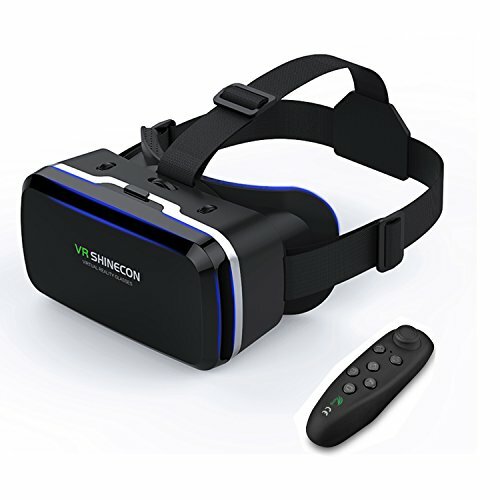 Comfortable Straps : These virtual reality glasses provide you a adjustable heads straps,easily to fit your head;bring you extra comfy and secure,even for moving around with ease; Plug & play,conveniently download 3D APP and plug your VR jack, showing you 3D virtual reality vision. Download 3D Video Apps :This VR googles can't automatically transform images to 3D format, you need to download APPs with 3D format video or watch panorama videos on YouTube, QR code and video source can be found on Google. 90 DAYS WARRANTY : 90 days warranty and unlimited return or exchange. Worry free for money back guaranteed. Friendly customer service and prompt support for every customer. So Click on it and buy it Now! Begin to experience Super 3D Video Film and Endless Future! If you have any questions about this product by SHiNECON, contact us by completing and submitting the form below. If you are looking for a specif part number, please include it with your message.